Astronomy resort offering horseback tours to study the skies. 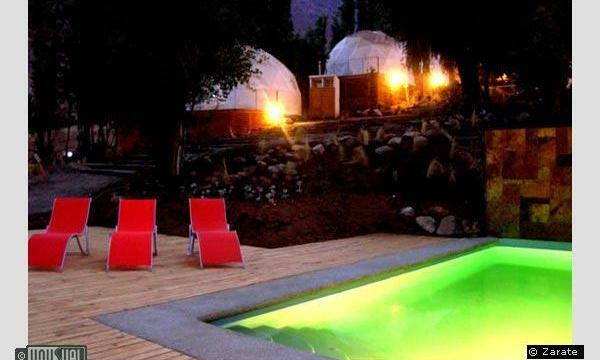 Born as a dream between the owner Esteban Zárate and his wife, and located in the famous Elqui Valley which is well known for it's clear sky, this Astronomy themed hotel offers night sky horseriding tours and your own telescope. 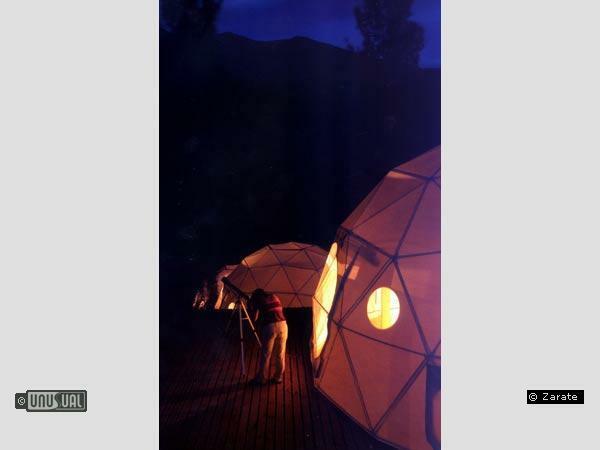 Built around the dream of watching the stars from your bed, Esteban discovered geodesic domes on holiday, and said: "that's it!!! 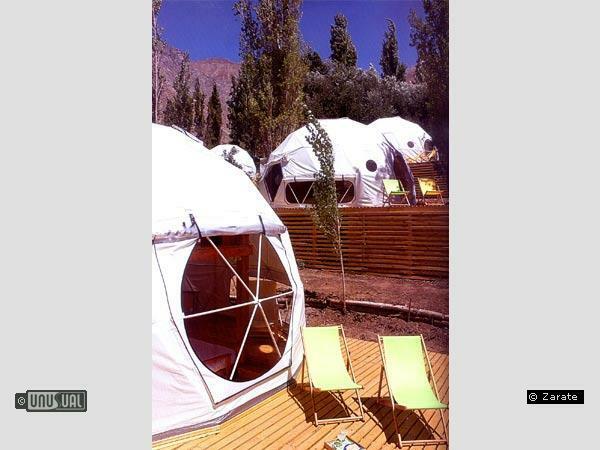 ", Leaving his job as a Regional Director of the National Tourism Board the journey to Elqui Domos began. Wanting guests to enjoy their dream and learn from the sky at the same time, they've included telescopes in each room and can share some of their passion and knowledge of the heavens to everyone. 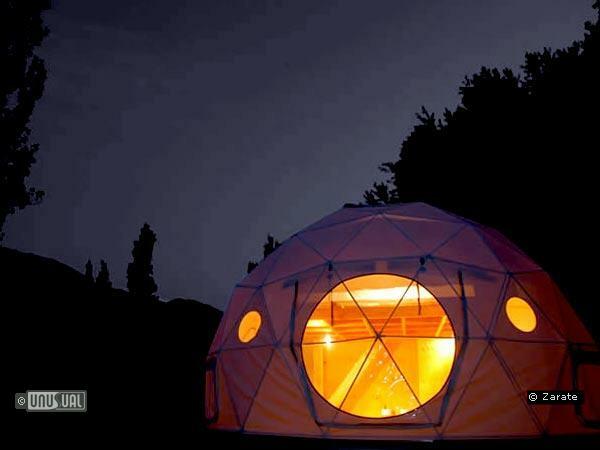 The dome tents have everything inside: a full bathroom, comfortable beds, heating, snack bar etc. but you should still dress warmly. Night temperatures can drop to below freezing during winter nights (down to -10° C). However, cold air makes for clear skies, and the absence of light pollution in the remote location makes viewing conditions close to ideal. 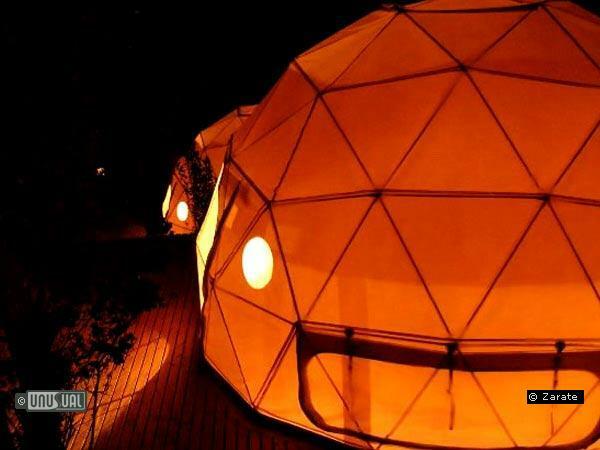 The 2 storey domes have a living room and bathroom on the ground floor. Upstairs is the main bed with detachable roof. 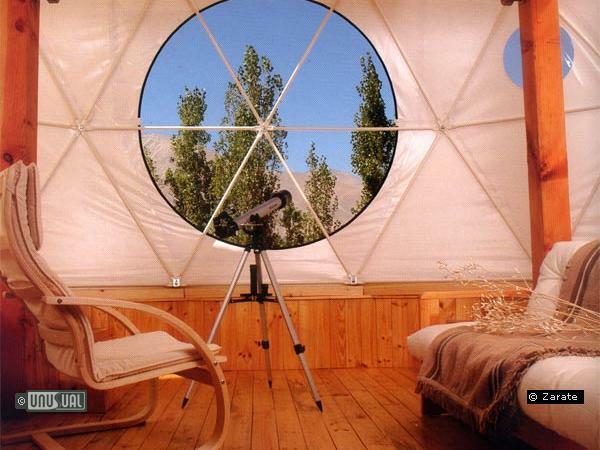 Each dome also has a large terrace and you are provided with a quality telescope to use. You'll also find a stocked fridge, tea and coffee facilities as well as maps and magazines about astronomy. Their on-site restaurant, Carinae (named after the most beautiful star you can see from the Southern Hemisphere) serves fusion food using local produce. Daylight provides an oppurtunity for picnics and barbecues by the river. All in all a very pleasant location! For those unfamiliar with night skies, Esteban and his team provide a stargazing tour and telescope-operating session to help you get the best from your evening viewings. They can also arrange a horseback stargazing tour, which should not be missed. Elqui Domos is about 1 ½ hours drive (96 km/60 miles) from the nearest large town of La Serena, on a road that is paved for all but the last 3 km (2 miles). Even this last stretch isn't difficult to drive at any time of the year. You can even take a bus if you're feeling a little more adventurous. Facilities for relaxation and entertaining partners less interested in heavens are provided, with a swimming pool and spa with massage treatments available. Bikes can be hired if notified during booking and horse rides arranged for treks and tours through the beautiful valley scenery. I had a wonderful time here with 3 of my friends. The highlight was the moonlight horse ride up in the mountains with Jose Luis. We enjoyed the sky, the food, the pool, the peaceful mornings, and exploring the entire area. Definitely recommended to all. I would like to give my best congratulations to "Elqui Domos", in Chile. at that moment administrated by Mr.Estéban Zárate and with all the preocupation of Mrs. Lermy. I was there when they were begining this biggest plan; but everithing in these place was absolutly wonderful..... so wonderfull that I've been recomending the place for too much people as I can, for every part of my country, Chile, and foreigners. I did have a spend 4 days with all my family, and all was so espectacular. Even I was with a horrible flu by the moment, all what I've received was the best attention and perfect emotion for all my family. All the people who have accused my recomendation, and had gone, have been very thanksfull, and specting to be there again. What to say about the sky at nights in this place...... not for nothing all the most best observatories are situated in this area. My best regards and CONGRATULATION to whom who are taking care of all these; and my best congratulations for beeing in this so important page in all over the world... big example for many others!! !